The Milwaukee Art Museum features the groundbreaking work of Brooklyn artist Mark Lombardi (1951-2000) January 13–April 10, 2005. 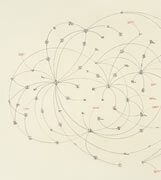 Mark Lombardi: Global Networks, the first retrospective of the artist's influential work, includes 24 of Lombardi's drawings-a new type of history painting. The retrospective, organized by Independent Curators International (ICI), presents Lombardi's visual narratives that map the way money flows in our trans-national economy. Because of its focus on often illegal and clandestine financial transactions, Lombardi's work attains almost prophetic significance in today's political and cultural climate. 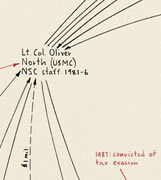 Examples of Lombardi's works include Oliver North, Lake Resources of Panama, and the Iran-Contra Operation, ca. 1984-86 and George W. Bush, Harken Energy, and Jackson Stephens, ca. 1979-90. Beginning with a prescient piece from 1984 and then moving to the period 1994-2000, most of the works are from the last three years of the artist's life. The exhibition includes several monumental drawings (some as large as 54 x 140 inches), the six successive stages of one particular drawing, and examples from the artist's index card archive. This retrospective affirms the significance of Lombardi's work, both in light of recent economic and political developments, and in their place in the critical dialogue concerning new directions in drawing. In delicate and poetic drawings, done with graphite and colored pencil, Lombardi mapped the economic underpinnings of our global society investigating financial scandals internationally. From small to monumental, the drawings are visual narratives of the way money flows in our trans-national economy: from corporation to political organization, from individual to various ad hoc groups, most of them acting outside of (and transcending) national boundaries. New York Times art critic Roberta Smith praised the "visual verve" of Lombardi's work, resulting from his "delicately tracing the convoluted unfolding of contemporary morality tales." Mark Lombardi called his works narrative structures because "each consists of a network of lines and notations which are meant to convey a story." Like any good script, the story told is one of major actors and minor figures, losers and winners, where the main action gets reflected and recast in side-lines and side-events, all contributing to a visually complex, intricate and sophisticated network or web made up of pencil lines. Smith called Lombardi "an investigative reporter after the fact." Lombardi tried to be as accurate as possible and was always careful to be clear that his research was not primary investigation. He used information culled from newspaper accounts, books, television and other sources in the public domain. His assiduousness is recorded on approximately 14,500 index cards, copious note taking having been the first step of his multi-layered process. Truly an artist's artist, Lombardi has been compared to Robert Smithson and Gordon Matta-Clark, in terms of the complexity of his work and the continuous influence he has had. Robert Hobbs, the curator of the retrospective, describes Lombardi's work as a "recasting of the public record in terms of art." He continues: "For him, art is a necessary means for visualizing information and for characterizing the ease with which enormous funds are laundered and channeled beyond national borders." 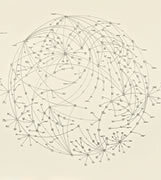 Charting patterns of exchange in the new global networks that have until now evaded visual description, the drawings' dryly lyrical lines are dashed, dotted, or continuous, signifying different kinds of financial connections. The drawings have an almost musical quality, where density of (trans)action is indicated by clusters of lines and marks, visually punctuating the sheets of paper like carefully placed musical notations. Most drawings are done on pale beige paper, in graphite and red pencil. They follow a time-line, often with dates arrayed across three horizontal tiers. These dates in turn support arcs denoting personal and corporate alliances, the whole comprising the skeletal resumes of the protagonists, whose names are usually mentioned in the works' titles. Lombardi worked on each "entity" or theme for a long time, adding more and more information in subsequent versions of the drawing, thus creating up to six steps to the final image. To clarify the artist's thorough approach, and for sheer visual pleasure, Mark Lombardi: Global Networks will include one work in all of its six incarnations. 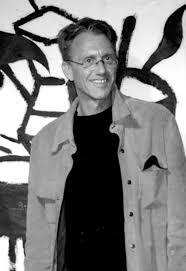 Mark Lombardi: Global Networks is organized and circulated by Independent Curators International (ICI), New York. The exhibition was curated by Robert Hobbs, the Rhoda Thalheimer Endowed Chair, Virginia Commonwealth University. The exhibition, tour and catalogue are made possible, in part, by a grant from the Judith Rothschild Foundation and by support from the ICI International Associates and the ICI Independents. The catalogue is partially underwritten by the Virginia Commonwealth University, School of the Arts with private gifts. The exhibition is coordinated at MAM by Margaret Andera. Mark Lombardi, Bill Clinton, the Lippo Group, and Jackson Stephens of Little Rock, Arkansas (5th Version), 1999. 61 1/4 x 80 1/2 in. (155.6 x 204.5 cm) Colored pencil and graphite on paper. Collection of Janice and Mickey Cartin. Mark Lombardi, Oliver North, Lake Resources of Panama, and the Iran-Contra Operation, ca. 1984-86 (4th Version), 1999. 63 x 82 7/8 in. (160 x 210.3 cm) Colored pencil and graphite on paper. Collection of Daniel Silverstein.